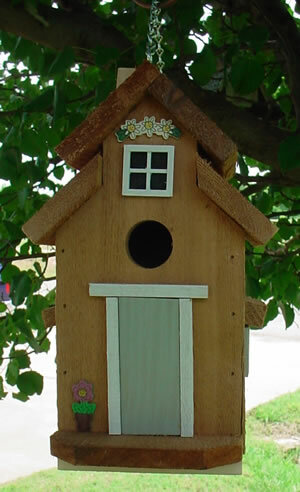 Dimensions 10.5" x 5.5" x 5"
House is constructed of untreated Western Red Cedar and decorated with Dove Gray trim. Decorated with faux door, windows, porch and cutouts (may substitute due to availability). May be ordered optionally with chain for hanging or as a pole mounted house. Bottom removes for easy end of season cleaning. Pole mounting option will just provide a flat base on the house. You can order one of our pole mounting kits, or provide your own mounting. Hanaging option includes screw eyes with chain for easy hanging from tree limb, hook or patio eave.